Hundreds of millions of people surf the web each day. Of these millions, many are using the web for the purpose of shopping. When it comes to finding specific items, one of the best means you can use to narrow down your focus is a search engine. In fact, a recent study has revealed that over 80 percent of people surfing the web find the sites they are looking for through search engines. What this means for your business is that it is absolutely mandatory for you to have a presence on the web. It's no good having the best quality goods for sale at unbeatable prices if no one knows you exist. Without an official website and subsidiary social media pages, you're going to go unnoticed all the way to an early bankruptcy. What Can You Do to Maximize Your Presence on the Web? In order to avoid coming and going in the blink of an eye, you've got to get your business noticed by a sufficient number of people. There are several means that you can use to achieve this goal. One of the most efficient ways to do so is to make use of Search Engine Optimization (SEO). SEO is the art of maximizing the content on your website for search engines. This means that when people search for a certain phrase – for example, winter coats – they should be able to zero in on the content that you have on your website regarding this item. The idea is for your winter coat content to be as close as possible to the first search result that comes up when they punch in this phrase on Google. How Do Search Engines Ensure Top Quality Content for Web Searches? But, of course, Google and other major search engines won't make it quite so simple and straightforward for you. Their reputation for state of the art customer service demands that they propel only top quality content to the top of their search results. If the content on your site isn't up to their standards – which change continually at a rate that they aren't making public to business owners – you're going to find your content at the bottom, rather than the top or even middle, of the results. Can PPC Be a Viable Shortcut for Gaining Maximum Exposure on the Web? There is a method that has been hailed as an effective shortcut to getting maximum exposure on the web without having to observe the normal rules of SEO. This method is called Pay Per Click (PPC) advertising. PPC basically comes down to the act of buying a series of ads complete with sponsored links that are tailored to show up in search results. What is the Main Benefit of Mounting a PPC Campaign? The main advantage that comes from using a PPC strategy is the speed with which multiple ads – each specially laced with multiple high-value keywords – can appear on search engines. Results can sometimes be measured within minutes. It's important to note that the higher the value of the keyword you are using, the more you will pay. Some PPC ads cost a penny per click, while others can cost as much as a dollar or more. It's up to each individual business owner to decide if the PPC approach is the best one to adopt. If your current conventional SEO campaign isn't quite getting you the results you need, you may be tempted to mount a high dollar PPC campaign just to bring in some needed traffic. However, the cost of doing so needs to be calibrated against the ability of your budget to withstand such a potentially heavy blow. Meanwhile, running a conventional SEO campaign may take longer to produce results but will definitely cost less in the long run. As a matter of fact, a recent industry study has shown that a conventional SEO campaign routine occupies 11 percent of the average business owner's advertising budget. Compare this with 87 percent that is devoted to PPC advertising. The difference is tangible and instructive. Perhaps the most important lesson to take away here is that an SEO campaign may be the “slow and steady” approach but will put less of a strain on your budget. A PPC campaign is flashy, noisy, and effective in the short term. However, the results it produces are necessarily temporary. For this reason, experienced business owners tend to use it sparingly in addition to, rather than in place of, a conventional long-term SEO campaign. When it comes to deciding whether to mount an “organic” SEO campaign or go the PPC route, there is one important factor to keep in mind. Making use of the conventional SEO methods will give your business a much-needed dose of long-term credibility. This is because your content will continue to be seen on a regular basis by web shoppers who prefer to do their own searching rather than being dazzled with a flashy PPC ad. Many people simply don't want to click the PPC ads that appear on the right-hand corner of their screen. They find these ads distracting and annoying. In addition, most people don't like a PPC ad of the pop-up variety that suddenly appears and covers up the content on their page. The only kind of response you'll get from this kind of person is a click away from your content. An organic SEO campaign will give you credibility with the kind of web shopper that prefers to find content at their own pace. This will help you build a positive public reputation that will give you top marks with people who prefer to shop long term in the same few locations. These are the kinds of customers whose loyalty will prove to be a major asset. It is true that PPC ads are certainly more noticeable than organic SEO. By definition, they can't help but be. And you will get a huge number of people that will gladly click through to your website. But, as noted above, the results are temporary. A PPC ad will only last for as long as you continue to fund it. If you are currently in the early stages of your career, the length of a PPC campaign will be limited by the size of your budget. Meanwhile, organic SEO lasts longer, costs less, and brings in the kind of people who prefer its slow and steady pace. You may not be able to get to the top of the search results page overnight. But if you keep at it long enough, you will eventually be in a position to reach the coveted pole position. So what you think? Is SEO worth it? 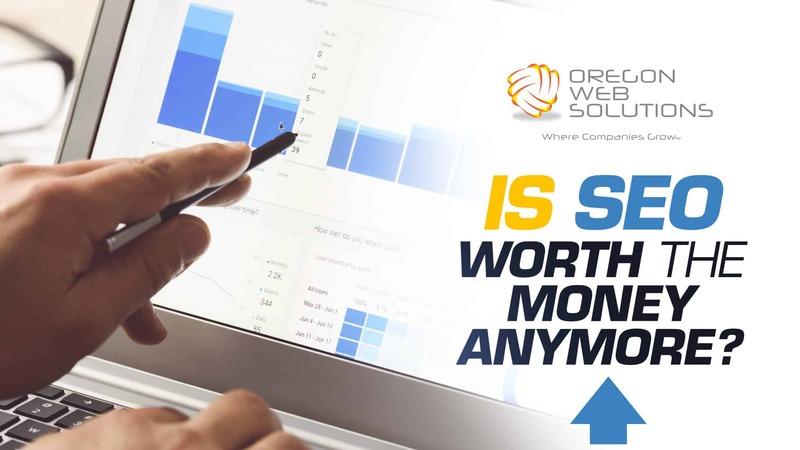 If you would like to find out how much SEO for your website would be, fill out the form below and we will send you a free SEO video evaluation at no charge. Is SEO Worth The Money Anymore? We Take A Deeper Look. Overall rating:	5	out of 5 based on 48	reviews.